Here is a great coupon for Contadina products. 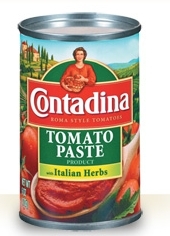 It’s for $.75/3 canned Contadina products 15 oz or smaller. This comes in just in time for me as I made a big pot of gravy (that would be pasta sauce for all you non Italians) and meatballs yesterday and used the last of my tomato paste. When these go on sale, and if your store doubles, this can score some cheap or even free products. The link is on the bottom of the page and you must register or sign in to access the coupons. We Hit 1000 Facebook Fans!